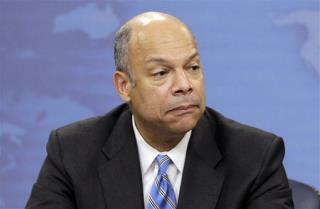 (Newser) – President Barack Obama is calling back a trusted counterterrorism adviser from his first term by nominating former top Pentagon lawyer Jeh Johnson as secretary of homeland security. Obama plans to announce Johnson's nomination tomorrow. He must be confirmed by the Senate before taking over the post most recently held by Janet Napolitano, who stepped down in August to become president of the University of California system. A senior Obama administration official today confirmed Johnson's selection, on condition of anonymity. What a joke, another unqualified, useless person appointed to a totally useless administration. The hole just keeps getting deeper and deeper. Just another person of COLOR added to the Hierarchy !.